ends early Sunday morning (2:00am) November 4th. Set your clocks back an hour late Saturday night. It is a good time to change your smoke alarm batteries as well. is attached. As a reminder if you have any life events you'd like to include in the newsletter, please send us an email. We are still looking for pictures for the 90 year celebration, don't forget to send them our way. Wednesdau July 4th. 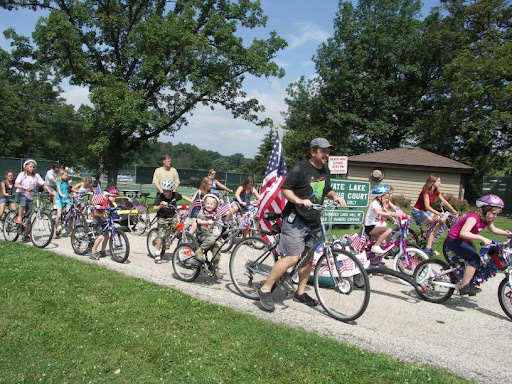 Come join the fun for the Annual Countryside Lake 4th of July Bike Parade! There will be prizes for the best decorated bikes, games and the Countryside Fire Dept. will stop by with one of their fire trucks for the kids (only if there are no emergencies). We will start lining up at the tennis court at 10:15. The parade will kick off at 10:30am sharp! Once we get down to the beach, there will be popcorn, a craft, games and the fire truck. For those members who would like to watch the parade and not particpate please line your chairs from the tennis courts to the beach. If you plan to drive over, please park on a side street for safety. lines have been added to the Association tennis courts. For those members who are unaware of what pickle ball is, it is a paddle sport that combines elements of badminton, tennis and table tennis. We hope you enjoy the new addition to our community. There is a brief video attached explaining how to play the game. Please come...we can really use your help!! Please join us for our first volunteer day of the year. It will be a great way to help your community and get some exercise while spending time with your neighbors. We will be spreading wood chips on the paths, removing fallen branches and pulling buckthorn, garlic mustard and other invasive species. Wheelbarrows and shovels will be provided but if you have some to bring I’m sure we will be able to use them! Join us at the Conservation Area (next to the beach) to help with this effort! Bring your own heavy duty gloves and bug spray. Please help us spread the word as we do not have e-mails for all CLA members. This would also be a great opportunity for any young people needing service hours!! Please find the April newsletter attached. If you would like to contribute information for the newsletter please send an email to countrysidelakeassoc@gmail.com. Please find attached the March newsletter. We hope you are enjoying them. If you have any information you would like to contribute please let us know. Some of the long time residences might know of fun or interesting facts about our community. It would be nice to share some of that information with our newer members. Also, if you have any life events you would like to share with the community, this is a great way to spread the word. We also wanted to remind everyone of the Annual meeting this Monday, March 19, at 7pm. It will be held at Countryside Fire Station 1 (same as the Board meetings). If you are unable to make it to the meeting, please send in your proxy. If you have misplaced your proxy and would like a new one, please email us at countrysidelakeassoc@gmail.com.